Enrol on the 6 Months Intensive Self-Study Certified Credit Professional (CCP) programme and get certified. Enrolment is in progress for June 2019 examinations. Get ahead of others as an Institution or as an individual professional and enhance your knowledge and skills in Credit Appraisal techniques and Credit Management. Practice has shown that Credit Management is one of the most important activities in any company and cannot be overlooked by any economic enterprise engaged in credit irrespective of its business nature. Sound credit management is a prerequisite for a financial institution’s stability and continuing profitability while deteriorating credit quality is the most frequent cause of poor financial performance and condition. Some studies have shown that there was a strong relationship between the financial performance of financial institutions (Banks and MFIs) and client (Borrower) appraisal, credit risk control and collection policy. The studies also established that client appraisal, credit risk control and collection policy significantly influence financial performance of financial institutions. It, therefore, goes without saying that a sound Credit Management system in a financial institution can only be achieved by, among other things, having well and rightly qualified staff in credit management to effectively and efficiently handle the credit function of an institution (Gatuhu, 2013). 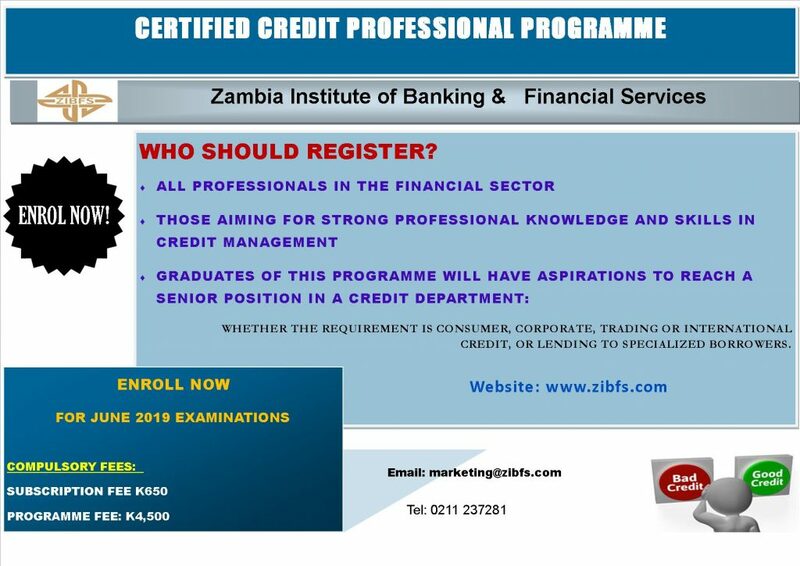 The Zambia Institute of Banking & Financial Services is here to partner with you and help you achieve that important balance between a sound credit management system and rightly qualified personnel. Download the detailed brochure HERE or request for it through email to marketing@zibfs.com or education@zibfs.com or reception@zibfs.com. ENROL NOW AND BE AMONG THE PIONEERS OF SOUND CREDIT MANAGEMENT!